The sun sets on Blue Wing Sou’ Side of Great Exuma. We are selling Blue Wing. I know, it’s sad. But when we started this adventure, I thought it would be great even if it only lasted one year. Amazingly, we we got to sail for five. Actually it is hard to believe we ever did it at all. 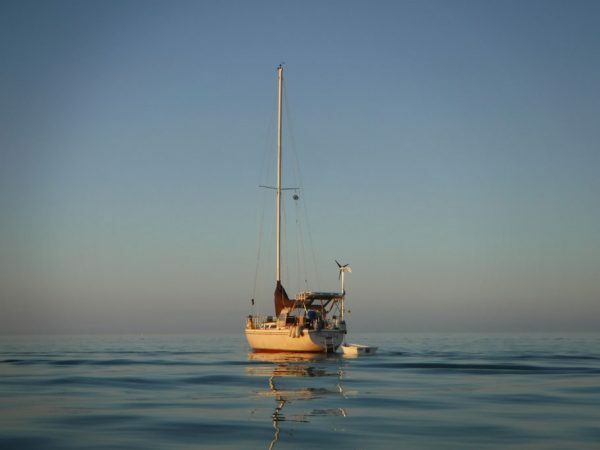 Sailing could have been just a whim that died unceremoniously, like my desire to be a punk rock bass player in my teens or a poet in my 30s or most any other thing I dabbled in until I met Greg. Perhaps it was on the first, second, or maybe even the pre-date that I told Greg that I was going to live on a boat. Once he heard that and then later saw my extensive power tool collection (I was going to rehab and build green houses for a while, too), there was no getting rid of him. And once he was on board, although the sailing dream did wane once, he never let it sink into an unrecoverable murky abyss. Blue Wing’s maiden voyage to the Bahamas anchored off of Gun Cay. 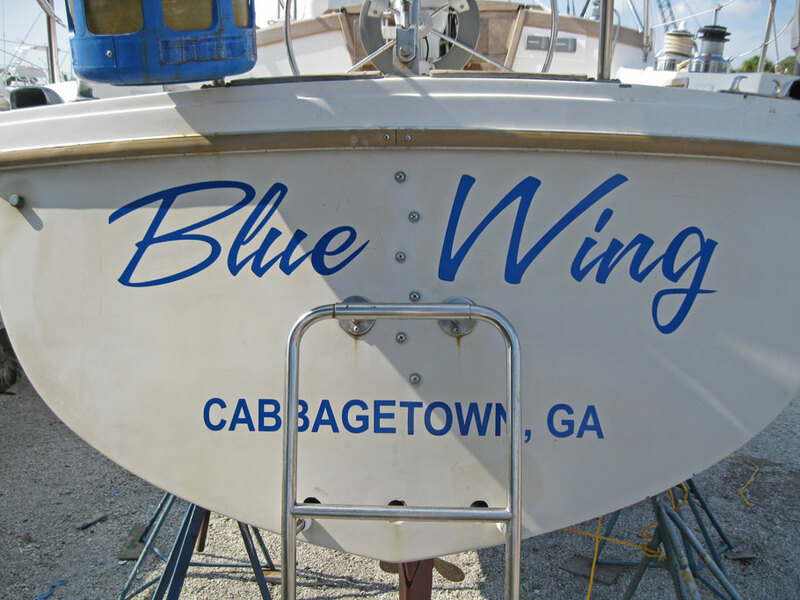 It seems like we knew so little when we started living the dream with Blue Wing. 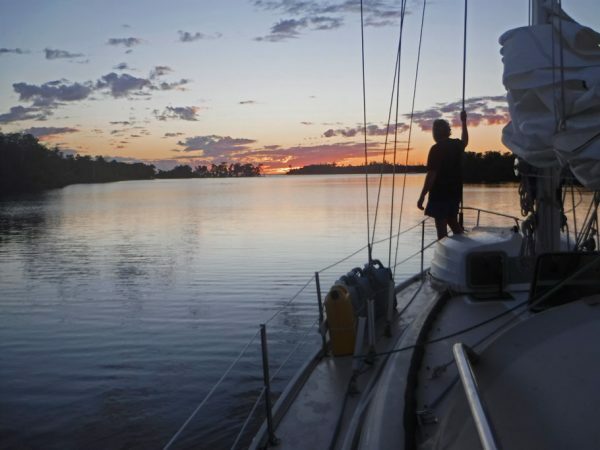 Yeah, we had taken a live aboard coastal cruising course, sailed almost every weekend on the lake over a whole winter and spring, and had captained boats on charters, but none of this prepared us for some very basic things we should have known in order to sail away into the sunset. We realized this for the very first time during our shakedown cruise to the Bahamas. As we headed out to sea, across the Gulf Stream, we were doing everything exactly as we were taught, sighting landmarks, getting fixes with our hand bearing compass, and plotting our path on our paper charts. Then Florida and all those land marks we were keeping an eye on disappeared over the horizon. We no longer had any idea how to calculate we were. 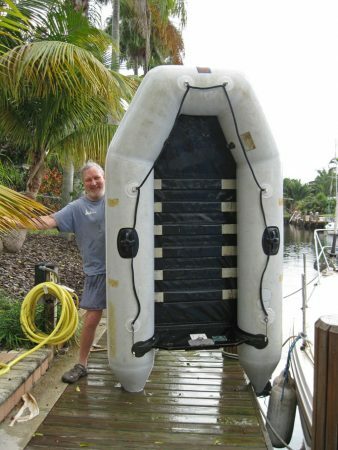 After holding course and pondering on this for a bit, I pointed to the binnacle and asked Greg, “What about this GPS thing?” We had owned the boat for 3 months, been up the ICW from Fort Lauderdale to West Palm, back down again to Miami, and finally navigated out the Port of Miami into the Gulf Stream miles from shore and had never turned on our chart plotter. 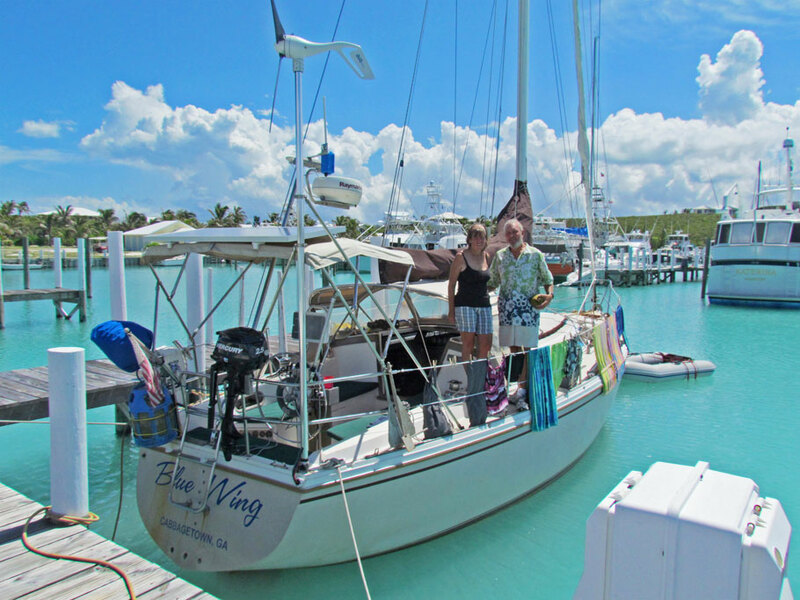 Blue Wing and crew at Sea Spray Marina on Elbow Cay in the Bahamas. Learning how to use the chart plotter was just the beginning of our education. I once had a seasoned sailor tell me just that no matter how long you have been sailing, you never quit learning. And we learned lots! Probably the most important things we learned were how to detect trouble and how to get out of trouble. Smell something burning? It might be the engine. Best go below and check it. Lose your fuel pump? You know that idea you had about learning how to anchor and set sail without an engine, you’re learning it right now. 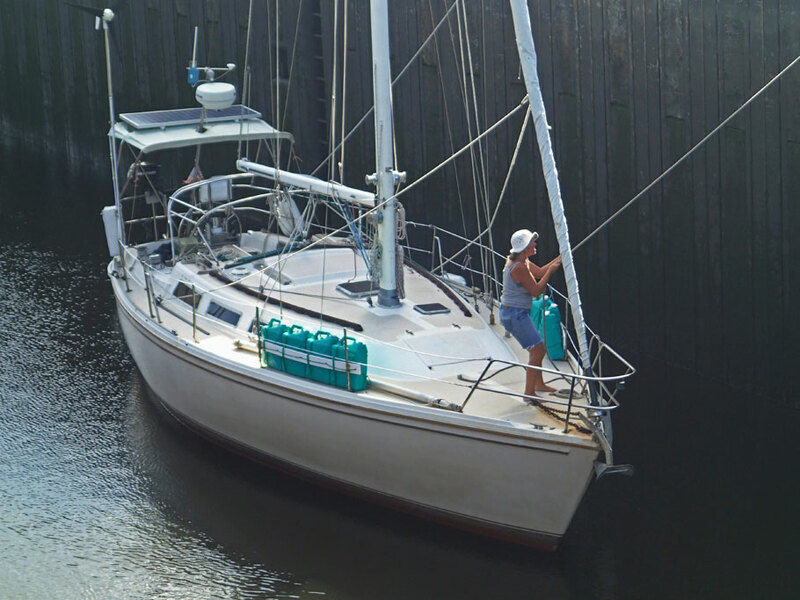 We learned that if you don’t use a spring line properly when you aren’t on a floating dock, your boat could end up under the dock on a rising tide – so not good. Up the mast at Cambridge Cay in the Bahamas. We learned that terror is always present at different levels. Going through an inlet with opposing wind and tide – high terror. Going to sleep at anchor – low terror (that is, until a 55 foot 3 story boat starts bumping into your hull in the middle of the night). We learned that no matter how mild or short a weather front might be, it is best to go hide from it unless you want to spend a day reliving your worst roller coaster ride on an endless loop (for some reason we had to learn this several times). 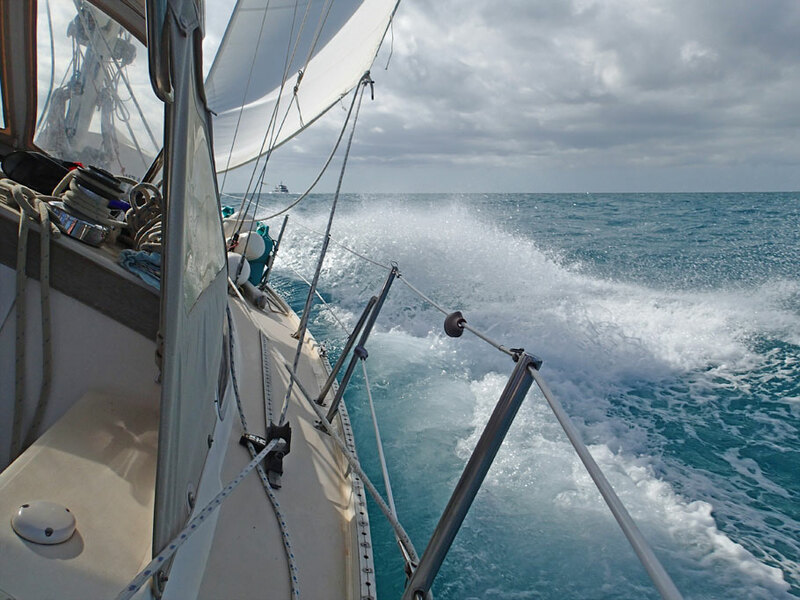 We learned that the currents can be crazy in Key West, that sometimes sailing just sux, and that the wind is a pushy beast. We learned that we could heel Blue Wing by ourselves to one side just enough so her 50’ mast could make it under a 48’ bridge, but that it is so much easier to pay the money and have someone do it for us. Duwan singlehands her through the St. Lucie Lock on her way to Indiantown Marina in Florida. 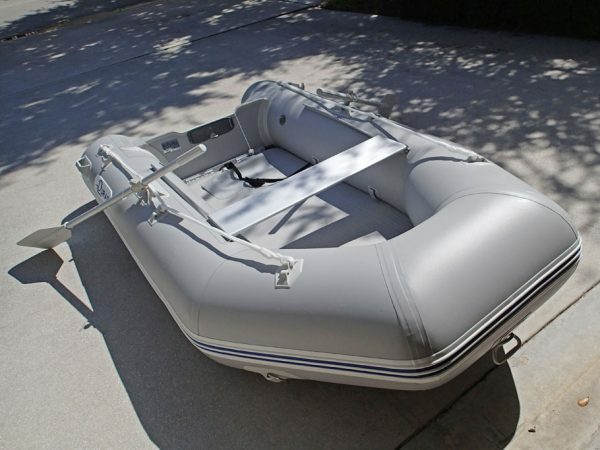 I learned that in Greg’s absence (whether planned, mysterious, or tragic), I could relocate and pilot the boat by myself. 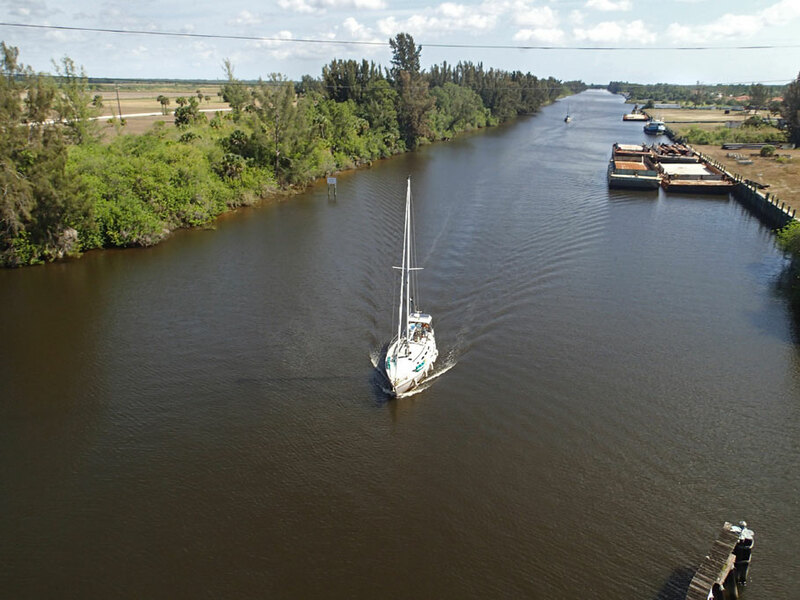 I also learned that single handing a boat through the St. Lucie Lock is not that big of a deal. Motoring down the St. Lucie River. And we learned that after 5 years when a problem as serious as our forestay and headsail falling into the Gulf Stream after being hit by a White Squall that first thing I need to do is go below to grab my camera, but seriously and even more importantly, that we can keep our cool while we take steps to secure the boat and get ourselves safely out of such misadventure. 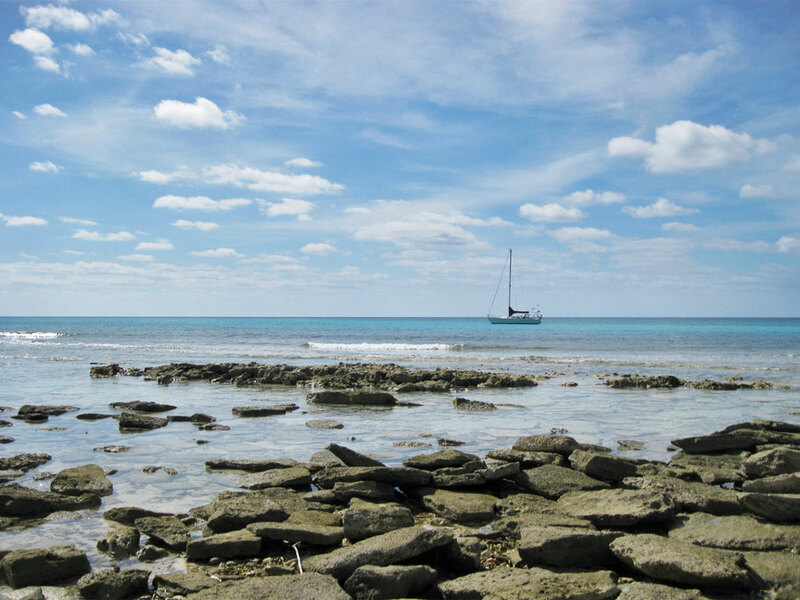 An exciting day of sailing in the Exumas. In the midst of all this learning how to live the dream we also got to explore the amazingly clear waters of the Bahamas, visiting places that we could only get to by boat, like the protected National Park, Conception Island, the many islands of the Exuma Cays Land & Sea Park, the rarely visited by anyone, Sou’ Side Exumas, and the remote Jumentos Cays. A calm day anchored outside of Key West. 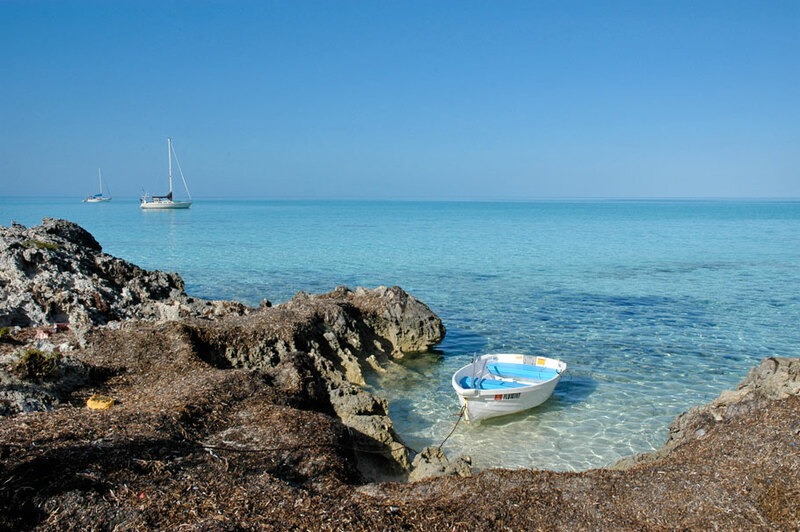 We got to visit amazing architectural sites like the Dolphin House in Bimini and the Hermitage on Cat Island. Constructed of found and recycled material by local historian Ashley Saunders, the Dolphin House is a labor of love and art covered inside and out with colorful mosaics of tiles, shells, bottles, coins, and and other interesting objects Saunders finds on the beach. The Hermitage, built in 1939 by Father Jerome, a Roman Catholic priest, is a small medieval monastery. It sits on Mount Alvernia, the highest point in the Bahamas. Greg watches the sunset from Blue Wing’s bow on Shark River in Florida. We also got to meet many amazing Bahamians like the women of Black Point and Edward, the septuagenarian who lives on an island in the remote Jumentos by himself raising goats and growing his own food. And have great new experiences like when Greg got to compete in a sculling contest on Earth Day in Governer’s Harbour in Eleuthera, we got to be spectators at a Bahamian regatta during Little Farmers Cay’s First Friday in February Farmer’s Festival (FFFFF), and I got to make special veggie meatballs to feed to swimming pigs of Little Majors Spot. And we made lots of sailing friends. Cheers to all you all! May the wind always be at your back. And while we are saying goodbye and reminiscing, i’d like to say a bit about the rest of the fleet. Blue Wing is not the first and only boat we are saying/have said goodbye to. First there was Little Willie John. Little Willie John, the early days, before we left for the Bahamas. Willie John was sort of like your first gold fish you get as a child that you love, but who, after innocent neglect, ends up floating at the top of the fish bowl and gets flushed down the toilet. 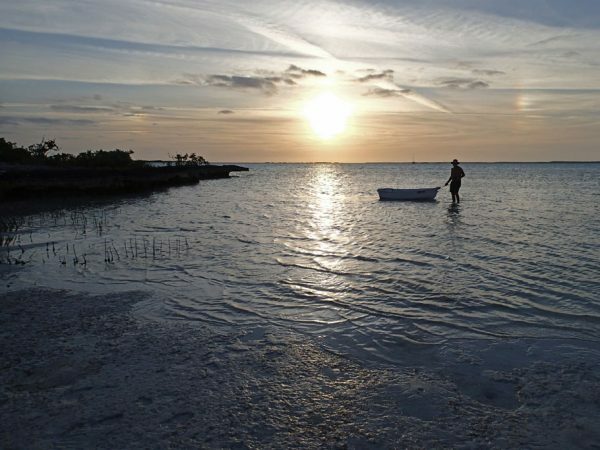 LWJ was not in the best of shape to begin with, but the beginning of the end for him probably started at Cherokee Point in the Bahamas when I dragged him what seemed like miles over a shallow sand bar set in some foreign art house movie. 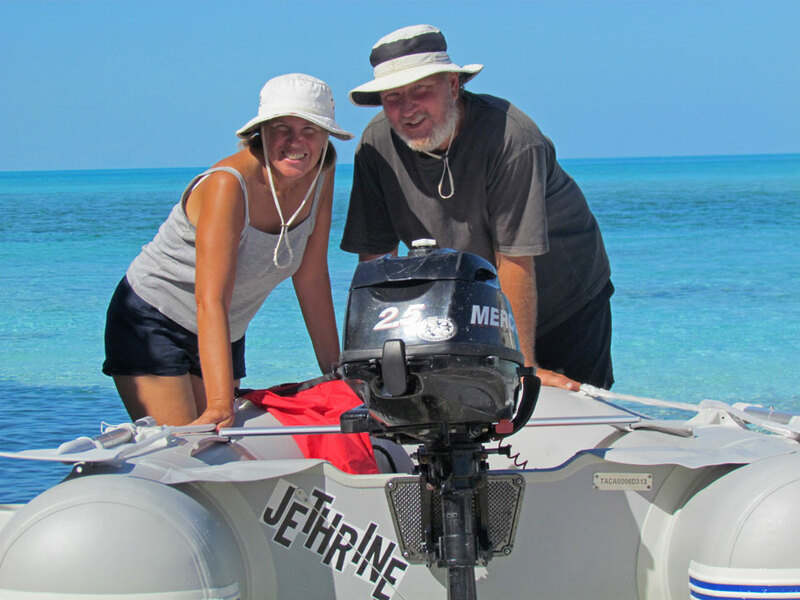 We tried our best to keep the poor guy alive that first season in the Bahamas, but he eventually he turned into a floating wading pool and finally sunk at the dinghy dock at Sunset Bay Marina with his outboard attached after we returned to Florida. With the help of two generous and very knowledgable sailors, Julia and Gail, who we happened to run into on the dock when made the discovery of Little Willie’s sinking, we were able to revive the outboard, but LWJ was eventually, metaphorically, flushed down the toilet as we tossed him in the dumpster behind the marina. Our attempt to repair his bottom after being dragged through shallow water. 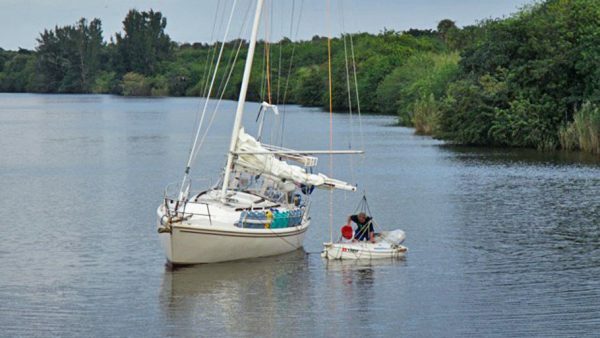 LWJ’s last days, being bailed after he and the outboard sank at Sunset Bay Marina. Fever waits for his crew as they explore ashore at Ship Channel Cay in the Exumas. Blue Wing waits in the background. If Little Willie John had a life as tenuous goldfish, Fever was as indestructible as an air plant (although my college roommate did kill an air plant in her sleep once). Fever, a hardshell Walker Bay, has been described as a plastic butter tub or a tippy clam shell, but we never paid any mind to those who looked down on him because even though he is as plastic as a Ken Doll, Fev has got way more personality. He was too much fun to dink around in on calm days like the one we had in Pipe Creek or in the mangroves we found on the Sou’ Side of Great Exuma. But he wasn’t great in rough water or going against the current. 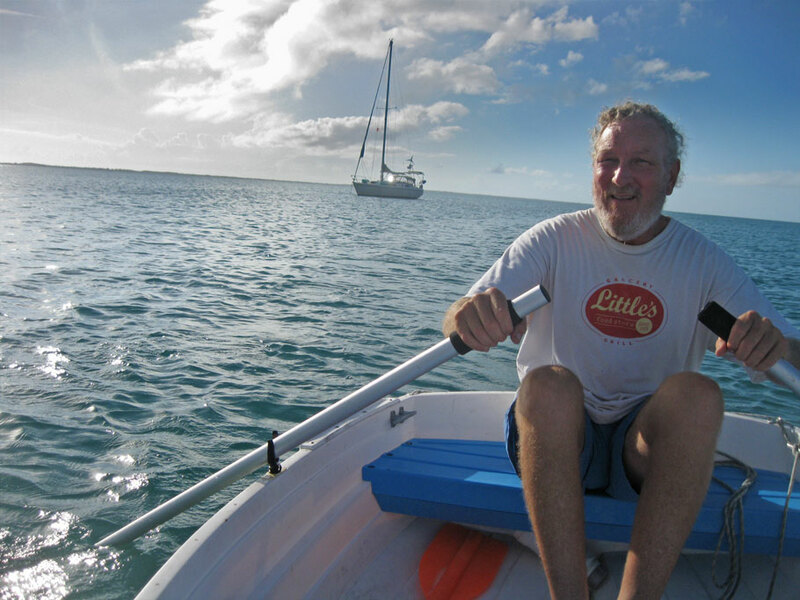 He didn’t like going through the tunnel at Lake Victoria in Georgetown and once we were out exploring Norman’s Pond Cay in the Exumas we had a whole anchorage, who saw us row off in our little butter tub, worry about our return when the weather turned bad. One friendly cruiser motored out to find us and “rescued” us and poor swamped Fever and towed us back to Blue Wing. Greg rows Fever at Powell Cay, while Blue Wing holds our spot in the anchorage. Sunset at Sou’ Side Great Exuma. Unlike the late Little Willie John, it was never a problem to tow Fever through shallow water. We added Jethrine to our fleet for our third season when we were expecting company. Fever doesn’t do well with more than two people, so we got Jethrine. 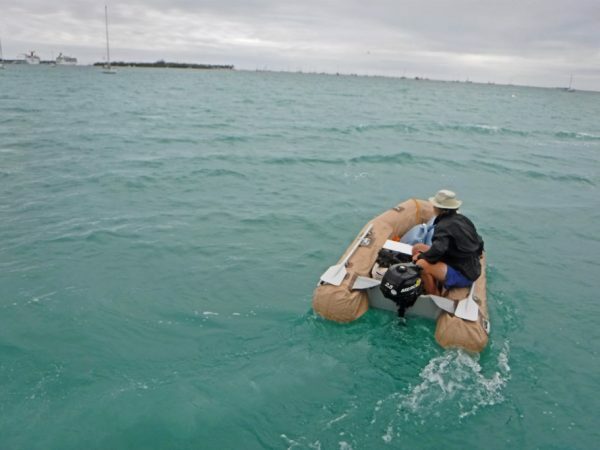 She is an inflatable dink with an inflatable floor which meant we could keep her stowed below when weren’t using her. Jethrine is big and fluffy and wears a frilly dress (ok, actually, not a dress, but dinghy chaps I made for her) and never comes out when Jethro is around. She was big fun when Karen and Brandon came to visit us in the Bahamas and when David and Michelle came to visit us in Miami. Duwan and Greg with Jethrine at Gaulin Cay. Jethrine sports her new dinghy chaps as she take Greg ashore on a dreary Key West day. The gangs all here! It took the entire crew and fleet to tip Blue Wing in order to get her under the Port Mayaca Lift Bridge. Duwan helmed while Greg rode in Jethrine and steadied Fever as he filled him up with water which weighed Blue Wing down enough on one side to tilt her 50′ of height to fit under the 48′ bridge. I’ve always said that one can’t be truly free all on their own. We wouldn’t have been able to begin or maintain our sailing/nomadic adventure without the help and support of so many friends and family. It is a give and take. We try to help people out and they help us out. And we always feel like we are getting the better end of the deal. Here are a few thank yous. I am sure that deep down Greg’s parents, Dossie and Perry Sifford, think I have led their son astray. I have read so many stories about sailors and adventurers with unsupportive families, that I feel really lucky. 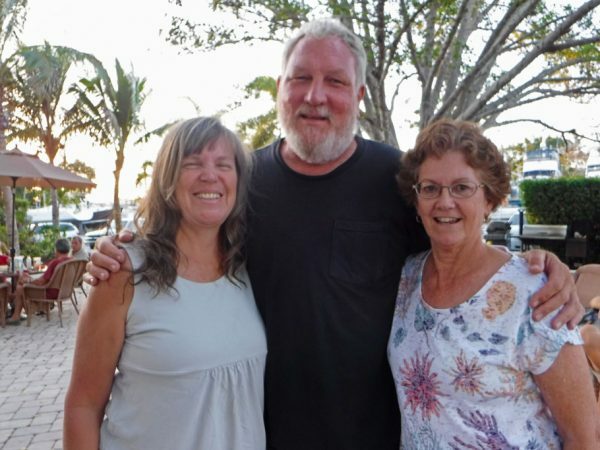 They have never said an unkind word about how we have led our lives and have always offered us help, including letting us use their home in Florida as a home base when we were sailing. Thank you Dossie and Perry for being such wonderful people. Our home port of Cabbagetown is the most amazing community on the planet. The world would be such a better place if all neighborhoods were a little bit more like C-town. When we first told our friends we were buying a boat, they were excited. They gave us the best send off party ever. And our bestest Cabbagetown friends Karen and Debbie were the first to come visit us in the Bahamas. When we didn’t know where we were going to go or do over the summer, Cabbagetown took us in and our season of house sitting and odd jobs/painting began. Cabbagetown even chipped in to replace my computer when it died while we were in Key West. Love you the most Cabbagetown! Brenda was a friend of Greg’s when he was growing up in Florida. 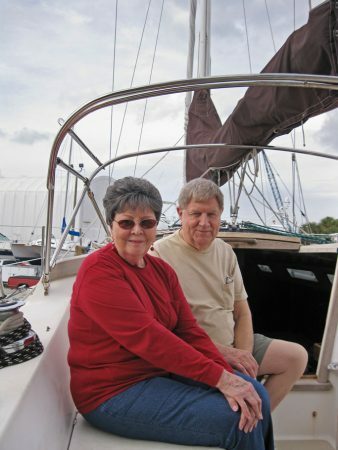 He reconnected with her when we first start coming down to Florida to sail. 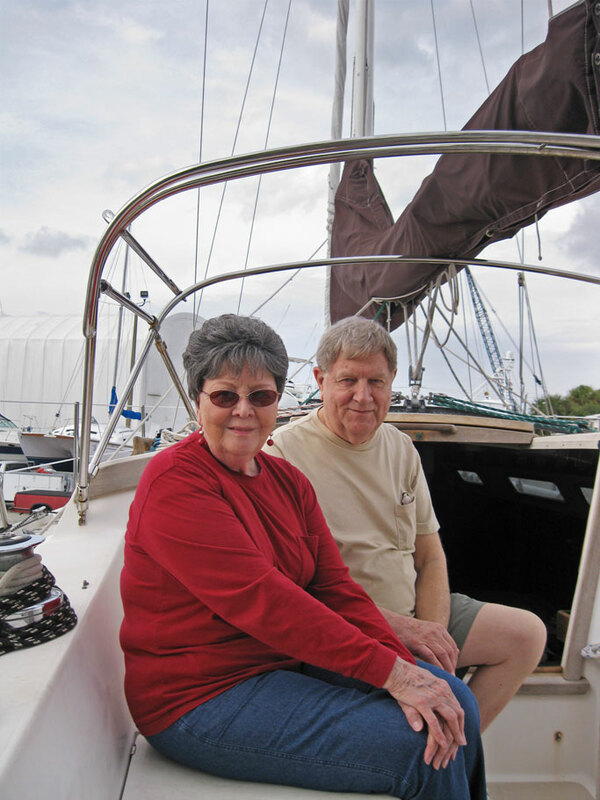 Our friendship with Brenda has been a wonderful bonus of our sailing adventure. She is an amazing person, a good friend, and has helped us out numerous times with rides and given us a room to sleep in and a place to park the van. So glad to know you Brenda! This is Bob. 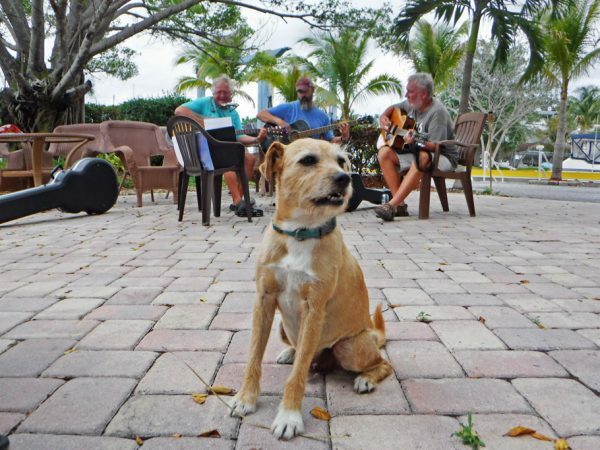 Bob is the mayor of Indiantown Marina. We are not thanking Bob – although we do appreciate the job he does at the marina – we are actually thanking some of his many constituents, who have leant us a hand over the years and have been good friends – most especially our friend Ellen, who let me come stay with her on her boat while I take care of selling boat stuff and was pretty nice about it when I cracked her skull open with a dinghy pump. 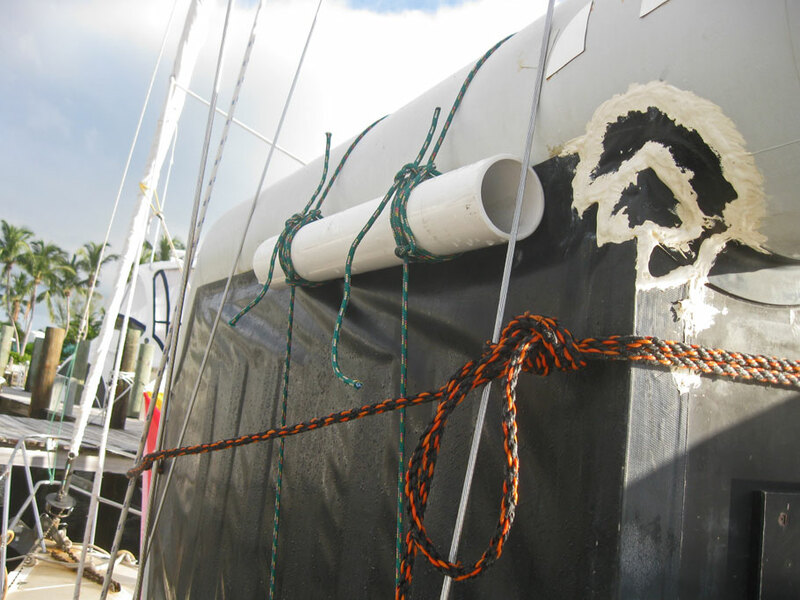 This may not be the end of sailing for us, but we are giving it a rest for a while. We are still going to be traveling (we have big plans for a more extended trip into Mexico for next winter/spring), but our crew will be narrowed down to just me, Greg, Bob, and Ballena Blanca — oh and maybe those kayaks we are talking about getting. I gotta start thinkin’ up some more boat names. 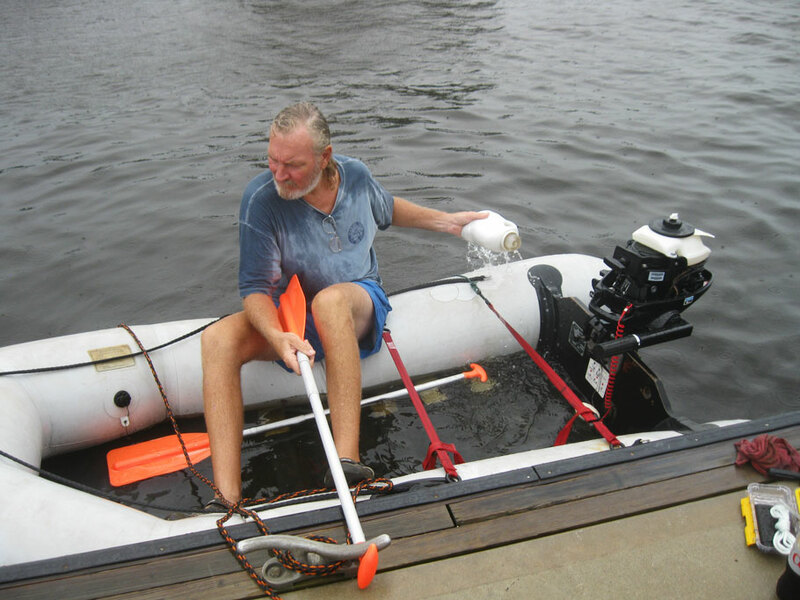 This entry was posted in Life on the Water and tagged goodbye, Thank you. Bookmark the permalink. This is a great retrospective of your time cruising on Blue Wing 🙂 Love Greg’s Little’s t-shirt. Can’t wait to see what kayak names you come up with. Thanks! Now I understand why newspapers already have obits written for famous people before they die – it is a lot of work rounding up years of your life into a blog post. I should probably start my goodbye post to Ballena Blanca now. I think our boat and vehicle names have gotten more interesting as we have gone along – I can’t wait to see what we come up with too! Your adventure was “our” adventure too! Many thanks for all the wonderful posts the last few years. I hope you adventures continue and keep us informed as always. We hope to continue having interesting adventures and sharing them here. Thanks for following along all these years, John! Now I’m crying too! One of the wonderful thing about Cabbagetown is so many people who love adventure. I am so glad you are having your adventure in Paris! I looking forward to hearing all about it when we are both back in C-town. 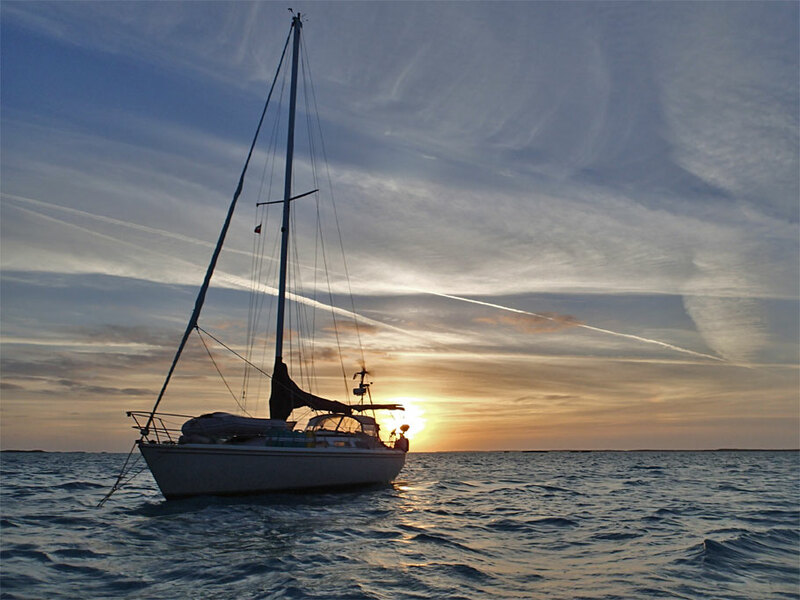 I have enjoyed all your sailing stories and your visits! I feel like I have lived your sailing life from a distance, and feel a loss that this trip is ending. You are both courageous and so ingenious! You have lived your dream and I feel honored that your let me be a part of it. Please continue to write and keep me abreast of your adventures! Love you both! Thanks Brenda. It has been so great getting to know you. We will continue to write and hopefully have adventures. Will miss you, but hopefully our paths will cross down the road again some time. I have been able to live vicariously through you, Greg, and BW. Thanks so much for the detailed chronicles of your adventures. Thanks for following along. We will try to continue to do fun and interesting stuff. Hopefully soon we can make a trip to Anderson, SC! Your journeys have wowed many of us, your followers. Enjoy your sabbatical as it can be rather an adventure in inself. Thanks for your generous sharing! Thanks and you’re welcome! It is an adventure all the time.